How It All Turned Out: A Kindergarten Story, 13 Years Later : NPR Ed NPR was there for 5-year-old Sam's first day of kindergarten back in 2004. His parents wondered if he was ready. This month, as he graduated from high school, they're still asking that question. 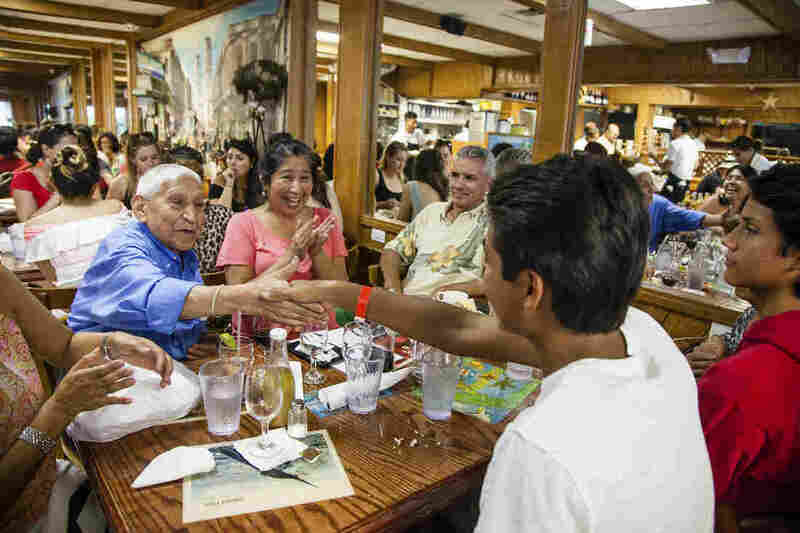 Sam Marsenison (foreground, in white shirt) and family gather in celebration at Puerto Sagua, a favorite Cuban restaurant in Miami Beach, on the eve of Sam's graduation. Today we're going to update a story we first brought you back in 2004. That September, NPR set out to document what may be the most important day in any young child's life — the first day of kindergarten. For parents it's a day filled with hope, anxiety and one big question: Is our child ready? The answer back then, as far as 5-year-old Sam Marsenison was concerned, was, "No, no, no!" For his parents, Paul and Maryanna Marsenison of Fort Lauderdale, Fla., it was tough letting go too. They had spent weeks, if not months, preparing themselves. But on that day, Sam made it very clear that he wanted no part of his new school, Virginia Shuman Young Elementary. Sam lunged toward Maryanna and wrapped his little arms around her waist, tears rolling down both their faces. In the background, the principal was on the PA system with a not-so-subtle warning: It was time for all kindergarten parents to leave. Immediately. And now it was Maryanna, not Sam, who didn't want to let go. For a while it seemed that even a tractor couldn't pull her away. Thirteen years later, Sam says he has only vague memories of the drama that unfolded on his first day of kindergarten. Now 18, he has grown into a tall, handsome young man with his mother's eyes and olive brown skin. A few days ago, Sam graduated from Fort Lauderdale High School, and he will soon be off to college. Sam is well aware that his parents are anxious, wondering — again — whether he is ready. "My parents are sending me across the state to go live by myself," he says, "which I've never done before." Sam is headed for Tallahassee Community College, about 460 miles north of Fort Lauderdale. His grades weren't good enough to get into Florida State University, but Sam hopes to transfer there, assuming he takes his studies seriously and his grades improve. Paul, his dad, has his misgivings: "I don't have confidence that he's going to take [his studies] seriously in the beginning." Maryanna disagrees. "I think he will. Because he's done a lot of growing up this past half year." Throughout high school, Paul and Maryanna struggled to get Sam to work hard, to think about his future. 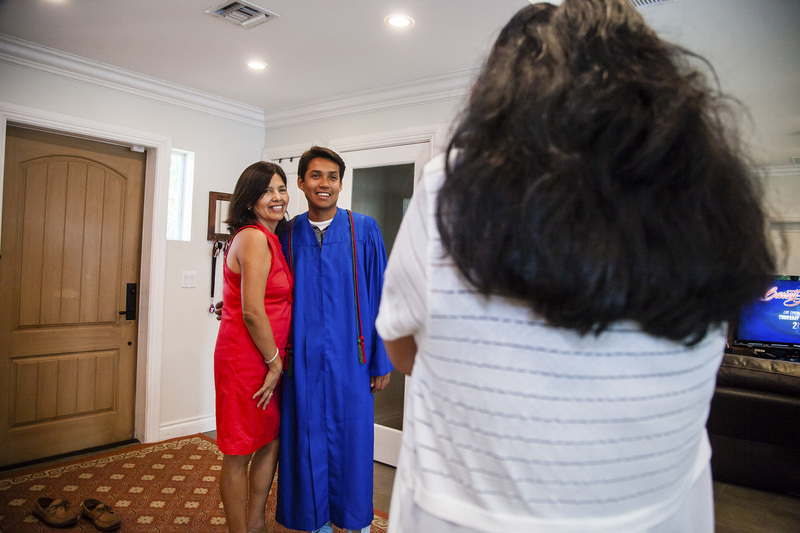 Sam and his mother, Maryanna, pose for a photo before Sam's graduation. "A year ago he did not even want to go to college," says Maryanna. At one point, Sam talked about joining the military. Sam, of course, has heard all this talk before, and he has told his mom and dad hundreds of times: "I'm definitely ready and I'm confident I'm going to do well." At Fort Lauderdale High, the few teachers who got to know Sam saw him as an average student. The one thing he seemed passionate about was fishing — especially with his dad. "Not every weekend, but we'd go quite a bit," says Paul. "And I think that has given him a tremendous amount of self-confidence." 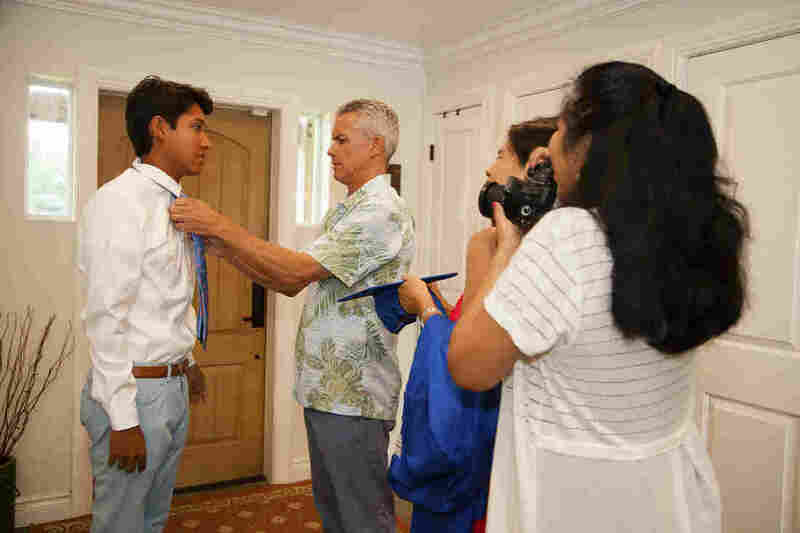 Paul helps Sam with his tie before graduation. Paul is convinced that being out on the water builds character. It's one thing that seems to truly bond Sam and his father. Paul says that's what he is going to miss most when Sam, his "fishing buddy," is gone. "We have to put him on a bus. Get him on a bus and shake him up a little bit," he told me. "Make him think on his feet a little bit." To this day, Maryanna is the hand-holder while Paul is the one pushing Sam to be more independent. It's been a tug of war of sorts. With only a couple of hours before graduation, the Marsenison home is abuzz with aunts and grandparents from out of town. I pull Sam off to the side to ask him how he is feeling. Paul and Sam drive to Sam's graduation. "I know I could've pushed myself harder, studied more, done better," he says. I ask him: Do you think you have to prove to your dad and your family that you're ready to work hard and have a bright future? "I don't think I have to prove it to them," he responds. "It's what I want for myself, so I'll do whatever it takes." "Heck, I might even work for my dad's construction business someday," Sam adds with a chuckle. 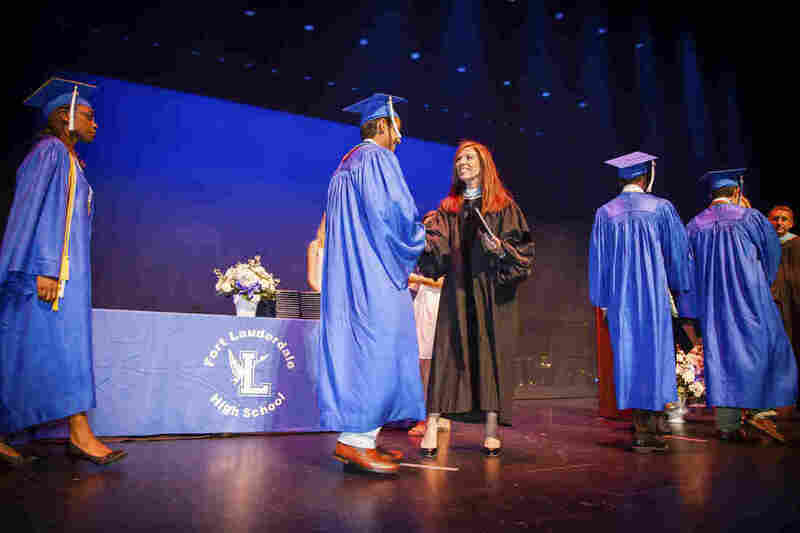 Sam crosses the stage to accept his diploma during his high school graduation at the Broward Center for the Performing Arts in Fort Lauderdale. I have a feeling Paul would really like that. Right now, though, the graduation ceremony awaits. First, Sam needs help with his tie. He has no idea how to put one on and his dad wasn't much help either. No problem: His mom is there to help. Maryanna still can't believe her little boy has grown up so big, so fast. She tries to hold her emotions in check, reminiscent of how she tried to hold back tears on Sam's first day of kindergarten. "Yeah, there's going to be tears, again," she says. "The emotions are the same. But I'm more confident because he's a real person now. He's a person, I should say. He was my baby." Sam just sighs: "They don't want to let me go," he says. How does that feel? "It feels good that they'll miss me." It's time. The entire family, aunts and grandparents, squeeze into the two family cars and make their way to the Broward County Center for the Performing Arts, where Sam and more than 500 of his classmates will receive their diplomas. As Sam walks across the stage with diploma in hand, Paul and Maryanna smile. Their 5-year-old has turned out to be a healthy, happy young man with a good heart. Yes, a late bloomer, perhaps, but someone they believe will one day make them even more proud than they are tonight.